Ania's our Philippine Australian Youth Ambassador and Miss Independence 2002. 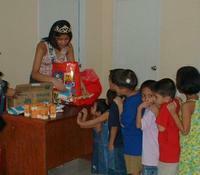 Here's she's handing out some presents to orphans in the Manila as part of our Philippine Support activities. It's really important to be able to do something even if it's only a really little thing to make a difference. Of course having great people like Ania willing to go out and help is what it allows these things to happen.